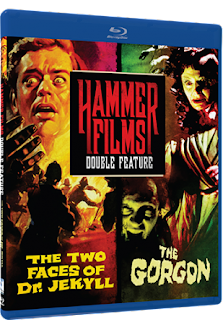 Home / 60s / Mill Creek Announces Two Hammer Double Features on Blu-ray this September!!! 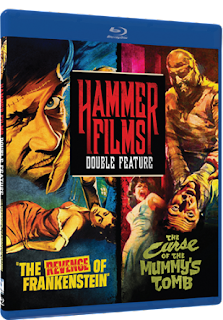 Mill Creek Announces Two Hammer Double Features on Blu-ray this September!!! Mill Creek has sent word that they will be releasing two Hammer Double Features on blu-ray on September 6th. Both of the films featured in the double features will be housed on one disc. There are no special features, but I am expecting the films to look nice. Mill Creek has stepped up there game in the last year or two and they are trying to bring us the best they can for the money. I have faith that they will do us fans right. Absorbed in research directed towards freeing the two natures of man, Dr. Jekyll degenerates in to Mr. Hyde, a vengeful maniac. While Hyde wants revenge against a gambler whom his wife is in love with, Dr. Jekyll, takes steps to do away with his evil self. In a rural village, a series of murders have been committed where each victim was turned into stone. A local professor investigates and finds an evil Gorgon haunting a nearby castle and in search of more victims. Peter Cushing reprises his famous role as Baron Victor Frankenstein in this horror classic. Rescued from the guillotine by his devoted crippled assistant Fritz, the Baron relocates and becomes Dr. Stein. Under the guise of charity work, he continues his gruesome experiments, this time transplanting Fritz's brain into his latest creation: a normal, healthy body. An American showman and financier disrupts the coffin of a mummified pharoah and finds it empty. The mummy has escaped to fulfill the dreadful prophesy and exact a violent and bloody revenge on all those who defiled his final resting place.